Different states require and ask different things of their notaries. At Notary Supplies Online, we are guaranteed to make the process as fast and simple as possible. Browse our selection of Notary Supplies to find items that will work best for you and your documents. Each of the items have been carefully crafted and selected to help reduce the effort and confusion of notarizing a document. Foil Seals are a smart addition to a purchase of an embosser. These seals are designed to stand out and give you that extra touch of authenticity on any document you may be notarizing. Foil Seals look great on certificates. Most states require a running record of documents a Notary Public has notarized. This Notary Public Journal is a great way to keep all of your clients' information and documentation in one convenient place in cases of auditing. With over 250 blank entries, you are sure to look and feel prepared and professional when using this Notary Public Journal. Within the last decade, many states are now requiring the use of a notary seal that is photographically reproducible. Evolving with the tradition of an embossed notary seal, these Seal Inkers allow you to keep the look and feel of a raised seal while also keeping it up to state standards. 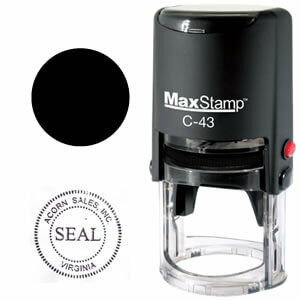 Simply use the Seal Inker to stamp over your embossed seal, thus allowing it to be photographically reproducible! 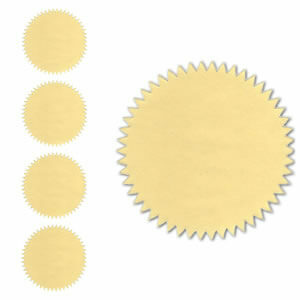 We offer top-of-the-line cloth stamp pads. Regardless of the size of ink pad for your hand stamp, we have got you covered! 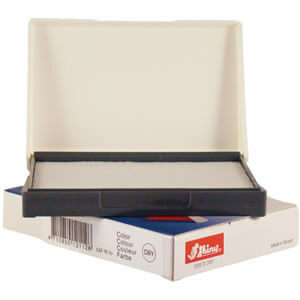 Our ultra absorbent rubber stamp ink pads are available in a wide variety of colors. 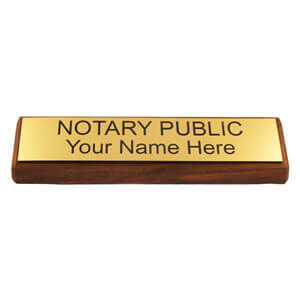 Quickly identify yourself as a Notary Public with these professional and polished Notary Signs. Available Notary Signs come in many different colors and finishes that are guaranteed to look amazing on your desk. Get in touch with us and drop us a line today for a free quote or personal assistance! Here at Notary Supplies Online, our team frequently orders items online. With personal experience - some good and some bad - we strive to make the ordering process for your Notary Public Supplies simple and fast. Many of our stock notary supplies are available to ship within 24 hours of purchasing. Not only do we offer quick turnaround times on our high quality notary public supplies, we also offer long-term customer support. We are individuals dedicated to providing exceptional service while also maintaining lasting relationships with our clients. We are in the office Monday through Friday to help assist you with any concerns you may have regarding your position as a notary public and questions about our products.